Recently, I worked on an implementation of Rational Team Concert (RTC) in a company in São Paulo. This company hired us to implement the Rational tool and to create its process of software development. This company also hired a Kanban professional. After a few meetings we decided to implement all together: the tool, the process of development and Kanban. This union turned out to be a success and opening my eyes to a new concept of the relationship between tools and process. The method Kanban of software development has an emphasis on preventing waste and workload, as well as offer a visualization of the development process. It brings several concepts like "pulled" work rather than "pushed", a team or a user only starts a new task when it is able to achieve it without compromising the process. Another concept of Kanban is the continuous improvement process where changes are welcome and implemented in an evolutionary way without generating major impacts all at once. And finally, another important concept of Kanban is the limitation of work. A team has a limit of work (items) in progress, this increases team collaboration ("swarming") to solve problems that affect the progress of the work. Another benefit of the work limitation, is that a team will never overwhelm and exceed its production capacity. 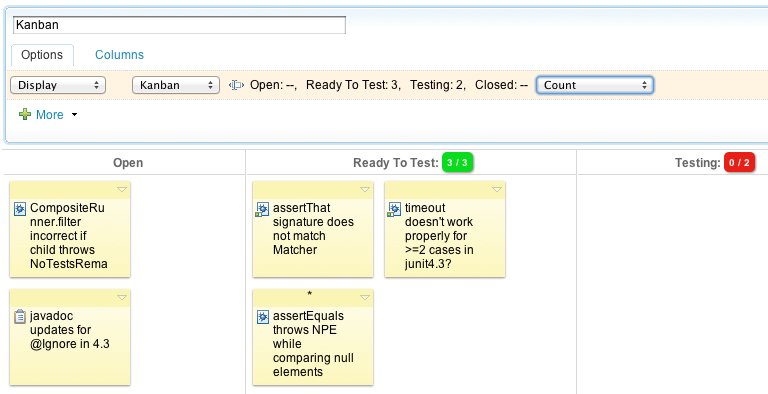 RTC has been over their latest releases, increasingly adapting themselves to the use of Kanban. The best feature in this direction is the limitation of WIP (Work In Progress). This feature along with the Taskboard Plan View, allows us to have a fully functional Kanban board within the web interface of the RTC. The columns are defined from RTC states groups configured in the workflow process. Flexibility: Both Kanban and RTC, are known for their ability to adapt to the changes. Environment: The replacement of the physical board with a virtual one, helps maintain a better work environment and aligns with global sustainability, eliminating the excessive use of post-its. Lastly, the combination of the RTC with Kanban is extremely beneficial and effective, and soon will become one of the most adopted market combinations.